Hannah Genders sees all the hard work pay off as her design wins gold at Malvern. It has been an exhausting and exhilarating few weeks at the Malvern Spring Gardening Show – and, amazingly, we won a gold medal and also scooped the “People’s Favourite” garden award. I have been working with an excellent team to pull this garden together, from Martin, who ferried all the materials backwards and forwards, to Richard and his guys who completed the build. We were on site for three weeks building the garden and then I roped in lots of friends to help with the planting. This took us five days and on most days there were three people helping. For a show garden you grow around three times as much as you need, and so you are constantly pulling out the best plants to put into the garden. I was also trying to ensure that the flowers would be at their peak by the Wednesday before the show, ready for judging. We completed the planting with one day to spare; this was so I could have a day tweaking the garden. In fact, the BBC came and filmed for most of the morning so I only had a few hours before judging to trim leaves, sweep the paving and generally try to get it as good as I could. You then leave the garden for the judges to come round; in my case this was on the Wednesday afternoon. Thursday at Malvern is press day and if you have won an award, it is sitting in the garden when you arrive early in the morning. My award was placed in the vegetable display on the table! I arrived at the show early with my dad, and it was very special to be there with him as the garden was a tribute to my mum. Then to find we had won a gold medal was amazing and very moving. The rest of the day was spent drinking some champagne and chatting to the visitors and press who came to see the garden. The remaining three days of the show were incredibly busy, giving out the several thousand leaflets we had produced and chatting to everyone about the garden. Everyone learnt the plant name Anchusa ‘Loddon Royalist’, a lovely bright blue flowering perennial I had placed at the front of the garden – this was a big hit with all the visitors, but unfortunately it got missed off the planting list so had to be spelled out for each person asking what it was. It was also great to have a number of Village readers come up and say hello. 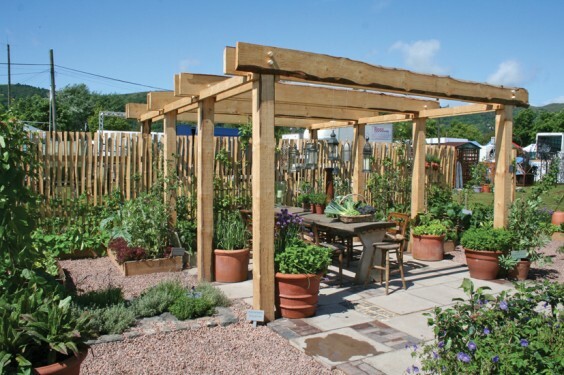 The garden is now gone from the Malvern site, but thankfully has a permanent home at Hillers Farm Shop, where we will be running workshops on growing fruit and vegetables. Details of these will be in future issues of The Village. A big thank you to everyone who helped make this garden the success it was.